Iran President Hassan Rouhani on Friday underscored that the cordial relations between India and Iran and reiterated that the relations between two countries were beyond trade and business. Acknowledging that India and Iran shared a similar history and culture with each other, President Rouhani said, "The relations between the two countries goes beyond trade and business, it goes back in history. We share cultural and historical relations with the two countries. Our and your artists, engineers, mathematicians and litterateurs ensured that our relations, which goes back in history are kept intact, which will strengthen our friendship and relationship in the future." 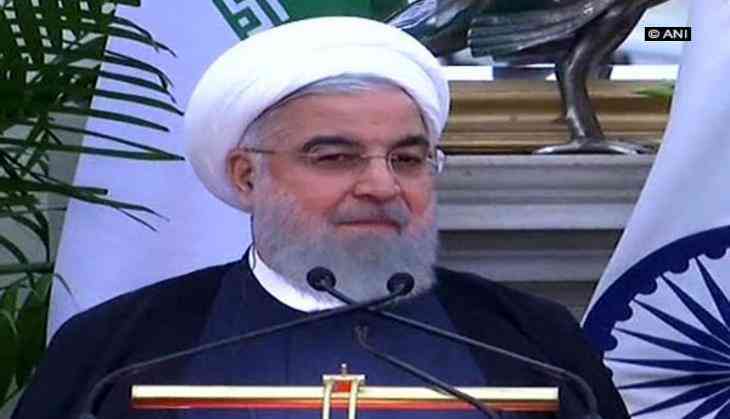 The Iran President added that the intertwining of two cultures indicated the strong bonding and reaffirming of the friendly relations between India and Iran. Comparing the Qutb Shahi tombs in Hyderabad with that of India's friendship with Iran, President Rouhani stated that the architectural style of the tomb safeguarded the relationship of both countries. President Rouhani added that the visit of Prime Minister Modi in Tehran in 2016 was an important step in the development of bilateral relations between India and India. He thanked Prime Minister Modi for the kindness and the hospitality served during his three-day visit to India. On Friday, President Rouhani visited the Qutb Shahi tombs in the Golconda area of Hyderabad. Located a kilometre away from the Golconda Fort in Hyderabad, the Qutb Shahi tombs consist of tombs of seven Qutub Shahi rulers. Constructed on an elevated platform, the Qutb Shahi tombs are made up of grey granite. These are dome-structured and have a quadrangular shape, having a blend of Indian and Persian architectural styles. The tombs were constructed by Sultan Quli Qutub-ul-Mulk, who was the founder of Qutub Shahi dynasty, a 16th-century dynasty that ruled parts of present-day Telangana and Andhra Pradesh, with Hyderabad as its capital.